Here's a shot taken of an Amtrak Empire State train, probably the Empire State Express, in the Rensselaer [Albany] station on a truly rotten day in the Winter of 1978. I remember a lot of old equipment and dirtyscratched windows. Many trains running late. It was a hot 1981 summer day in Windsor, Connecticut, and I tested a new telephoto on one of my least favorite pieces of railroad equipment, a self-propelled [SPV40?????? 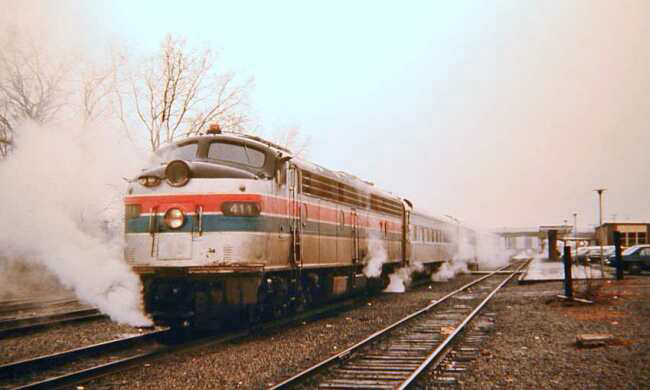 ], which Amtrak or the State of Connecticut paid something like a million dollars apiece for and put on the Springfield line with great hoopla. Forever breaking down and almost always late it seemed, they were capable, when working, of high acceleration and a very smooth ride. Here is Amtrak's Chicago-Milwaukee-Minneapolis train, 'The Hiawatha', photographed in Wisconsin Dells, Wisconsin, on a Sunday in 1973. The day I photographed it the train's consist included a diner-lounge, and on the end, a domed parlour-lounge for first-class passenters as well as a dome coach. On Monday, Wednesday and Saturday the westbound train went on to Seattle via Billings and Missoula as the North Coast Limited, and included a dome lounge sleeper and sleeping cars. Amtrak also ran the 'The Empire Builder' daily between Chicago and Seattle, via its current route through Havre and Glacier Park. Both 'The Hiawatha' and 'North Coast Limited' would soon be gone. 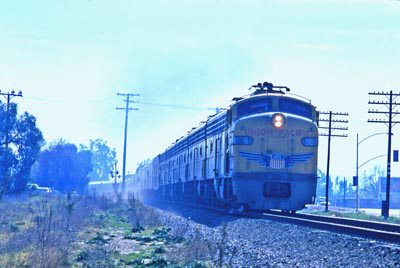 Here are two of my favorite photos, Union Pacific Train #103, the Chicago-LA City of Los Angeles-Challenger Domeliner near the end of its run, in Riverside, California [note all the fields], 30 years ago. Never quite as elegant as the competing Super Chief, this train, like most run by Union Pacific in its last days of passenger service, was nevertheless a solid monument to the practical hotel on wheels -- crackerjack timekeeping and friendly no-nonsense service across a beautifully maintained right-of-way, with a consist for everyone, including an array of conventional coaches, sleeping cars, a dome lounge, dome coach, dome diner, and coffee shop lounge car. Changes last made on: June 30, 2002.